Spyderco C79PSBBK C79PSBBK Assist Black SpyderEdge Folding Knife FREE SHIPPING! Designed especially for first responders, the Spyderco C79PSBBK Assist Black SpyderEdge Folding Knife is a lightweight rescue knife. This Spyderco rescue knife features the Spyderedge serrated blade which is perfect for cutting through ropes or seat belts. The blade is coated in a non-reflective black carbon nitridge and made of tough VG-10 steel providing excellent cutting ability. It features a raised thumb hole called the Cobra Hood to allow the user to easily locate the hole for opening and closing of the knife. The top of the blade on the Spyderco Assist knife has a wavy jimping pattern to allow a better control. The handle is made of fiberglass reinforced nylon and the textured handle allows you to hold onto the grip securely and comfortably. Built into the handle, the Assist has a glass breaker that will protrude out when squeezing the handle and retract back in upon release. A survival/rescue whistle is built into the end of the handle as an added feature. This knife also has the ability to cut rope without fully exposing the cutting edge. This is done by placing the rope in the groove and closing it shut. 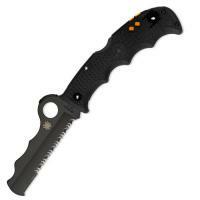 Spyderco Assist is the perfect gift for that firefighter and EMT in your life, get yours today! ©2002-2019 CopsPlus.com: Spyderco C79PSBBK C79PSBBK Assist Black SpyderEdge Folding Knife FREE SHIPPING!